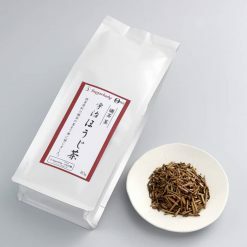 Roasted tea made in Kyoto Uji using only the stems of green tea, “Tencha”. Can be served for any occations, to accompany any meal or sweets. Stems of the green tea only grown in Uji area of Kyoto prefecture were carefully slow roasted to become this flavorful “Tencha” tea. Tencha, is the raw material for “matcha” green tea. Tencha is a general term for the tea leaves that have been covered over 20 days, which makes the leaves thinner and more tender. Leaves are then harvested and steamed, then dried without kneading. (Sencha tea would go through another process of kneading before the grinding process.) Matcha is the powdered form of this tea. It contains a type of Amino acid, L-Theanine which is rare-occuring, found only in a few types of plants including tea and a type of mushroom. L-Theanine helps relax, improve the quality of sleep, mitigate mental stress, improve mental focus and memory, and lower blood pressure. Pour the boiling water into a teapot with Sugarlady’s Tencha tea leaves inside the pot. After steeping it for about 30 seconds to 1 minute, the tea is ready. Pour the tea into a tea cup. If the tea is to be served into multiple tea cups, pour a small amount into a cup then, move on to the next cup to pour the same amount. 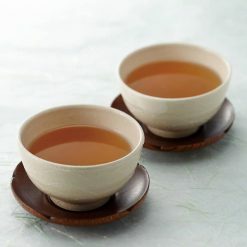 Repeat and add more hot water if necessary, until all the cups are filled, to achieve the same consistency of the tea. This product contains green tea (Kyoto). Origin of ingredients: green tea (Kyoto) Prepared and packaged in Japan.